I know what your thinking. “Not another kitchen update (eye roll). But no! This post isn’t at all about the kitchen. 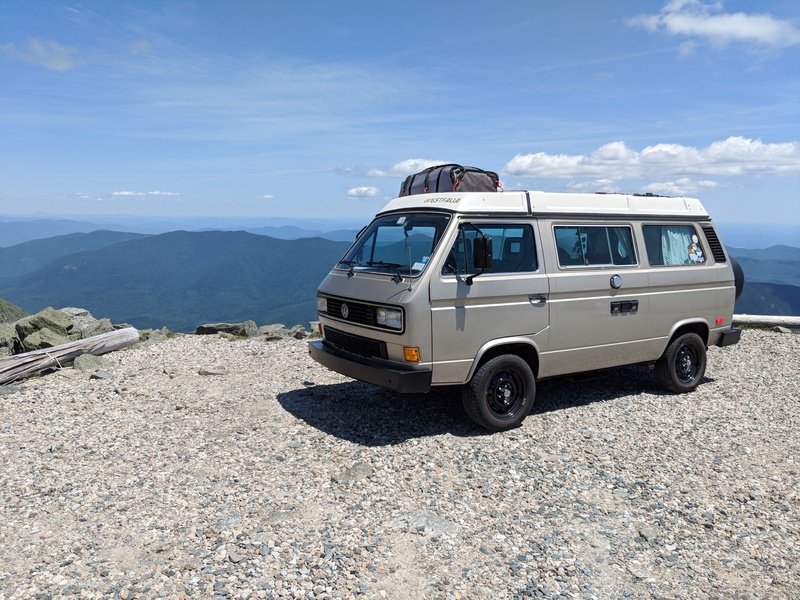 This is about our van trip to the white mountains and Mount Washington. The White Mountains are in New Hampshire. The very North end infact. It’s a solid 6-7 hour drive. We left of Saturday morning and had an absolutely lovely drive up there. It was in the 60’s, so cool in fact that we didn’t even roll down the windows. Just opened the vent and it was very comfortable. 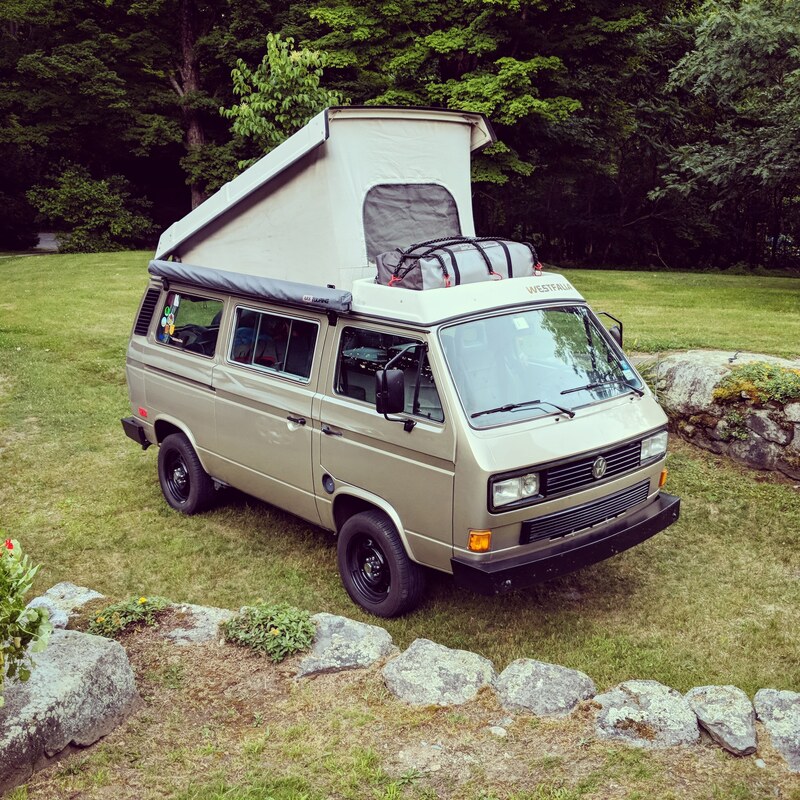 We got to Littleton NH in the late afternoon and were generously invited to stay at a coworker’s family home for the evening as I couldn’t reserve a camp site. Sunday was the big day! 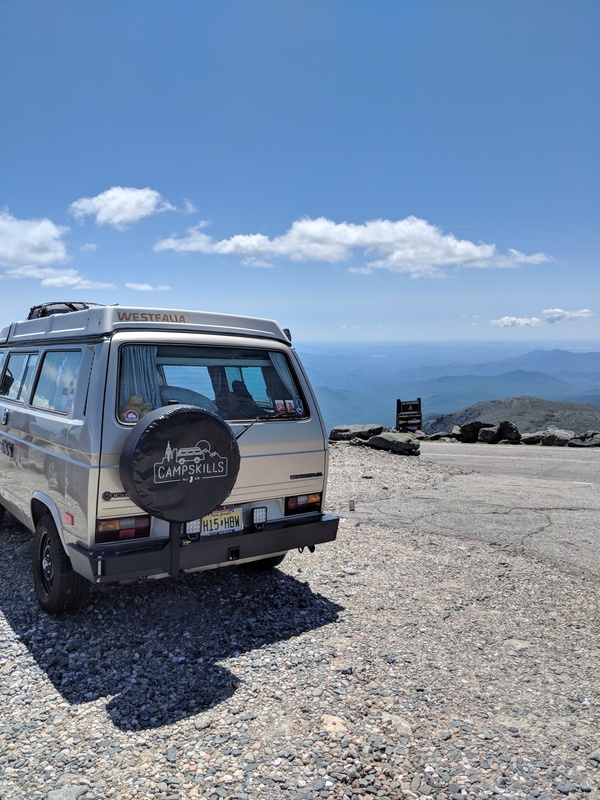 The ultimate east coat van mountain adventure. 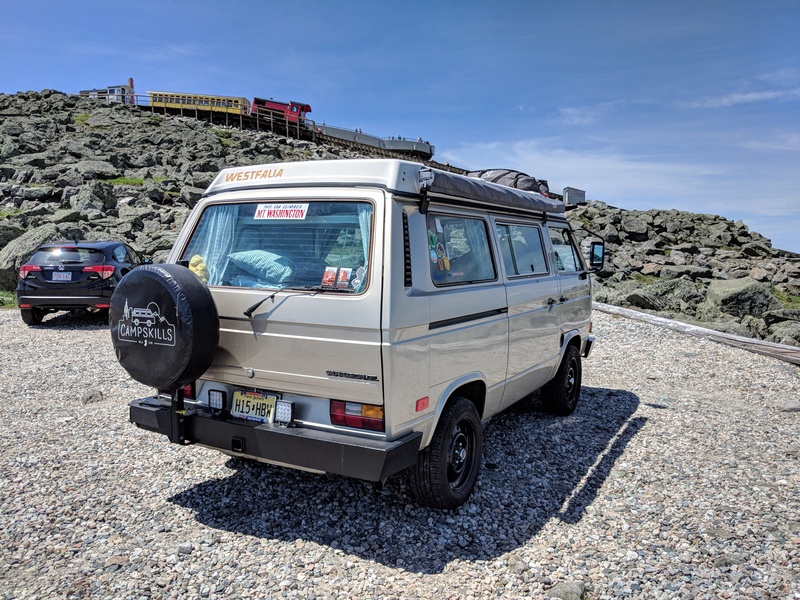 Mount Washington is the highest peak in the North East United States at 6,288.2 ft. There is an auto road that has been functioning since 1861! It is a 12% grade for much of the road. It 7.6 miles and it is a killer. 2 lanes, very tight and in a 30 year old van completely thrilling. It was 1st and 2nd gear the entire way and by the time we got to the top Kate was in tears and I was shaking and about to pass out. Now, let me explain. If you’re a bit queeze when it comes to heights this is a real thrill ride. That said if you’re a bit queeze about your 30 year old van exploding then it’s a entirely other type of thrill ride. 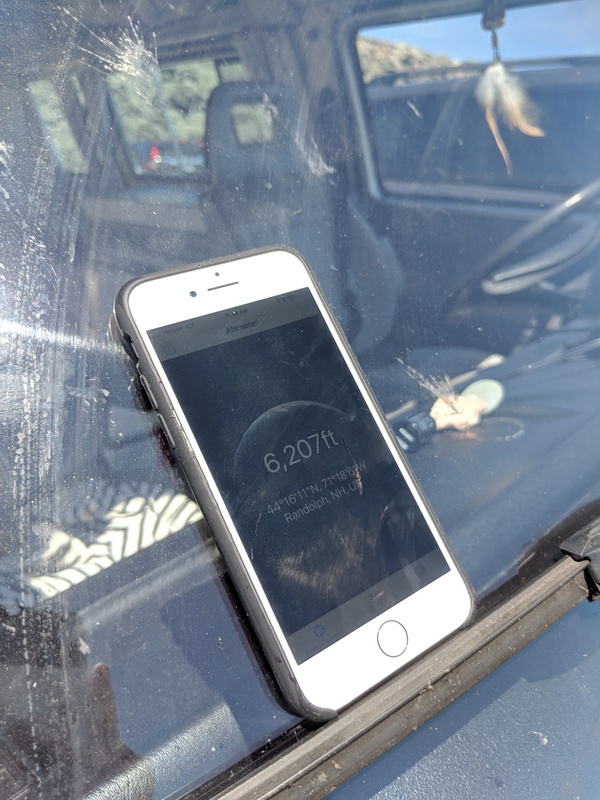 The van did great the entire way up, but you never know with these things. If we had broke down up there it would have been impossible to get to a save spot to wait for help. It was great! The relief of the accomplishment over shadowed the veiws and I did a terrible job getting any good pictures. (classic Paul blunder). Notice in the first picture below the moutian train. If you’re not interested in testing fate it’s a great option. The way down the mountian was a pretty tough one. The breaks got a good bit hot. so much infact that they were smoking pretty bad. 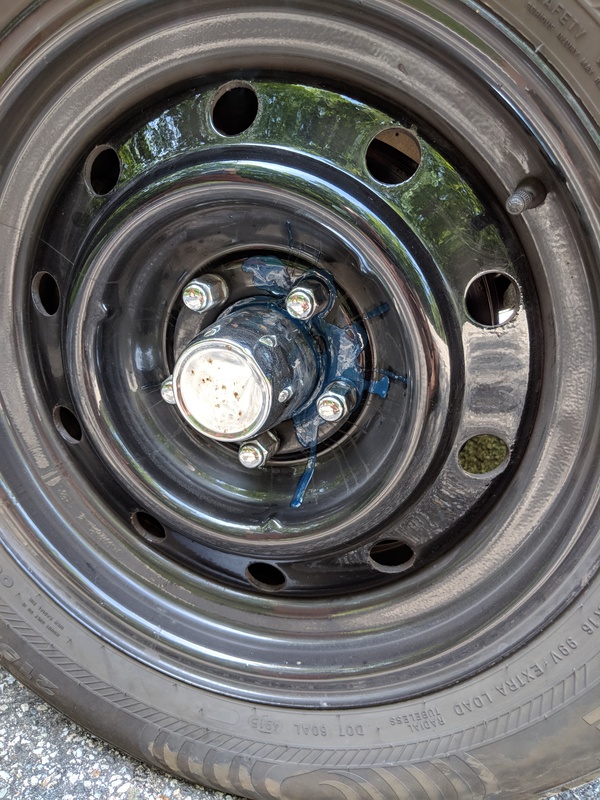 They then started to leak melted grease from the hubs as it had been heated to a blue liquid. Crazy! The blue goo leaking out of the hub, burning up. 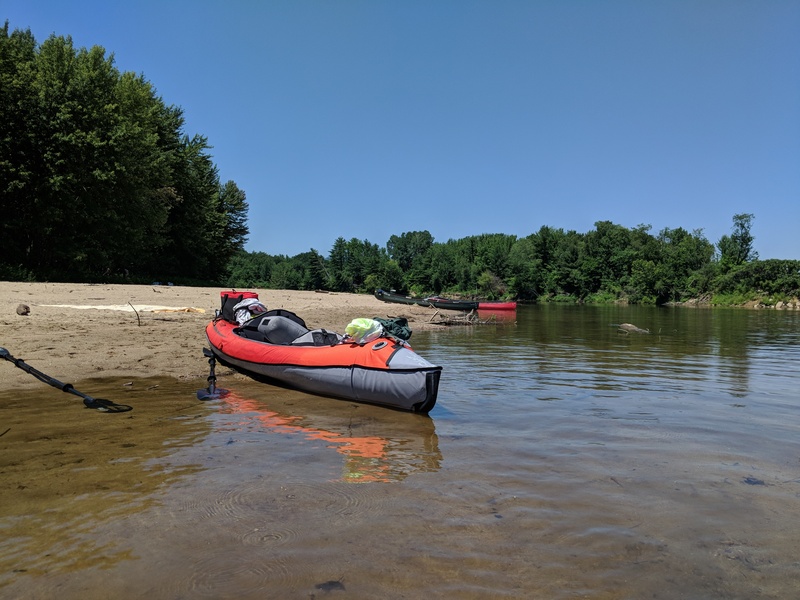 Monday we got the old inflatable kayak out and in true Kate and Paul fashion became far too ambitious in your kayaking abilities. 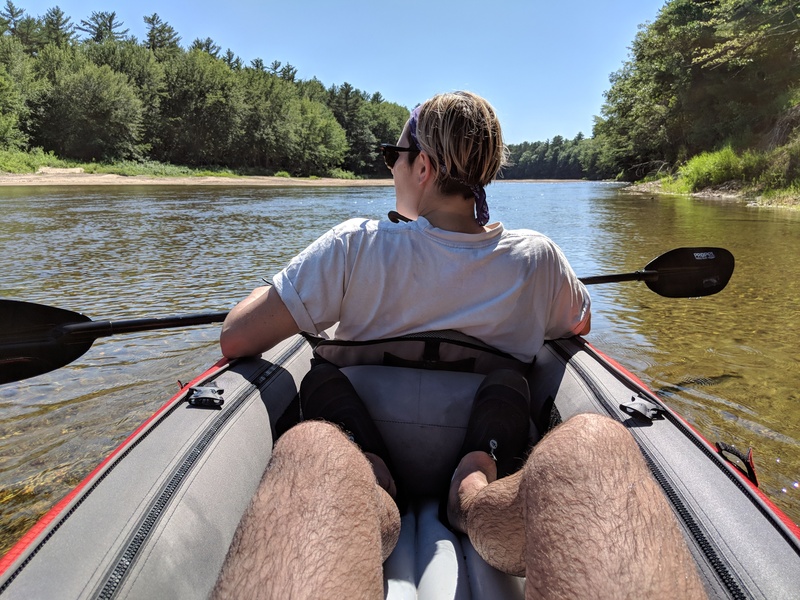 We wanted up paddleing a total of 6 miles. The back end of that up stream. Before you label us two stupid fools. The current was very week. It still hurt. We also got a good about of sun. Not terribly burned, but burned enough. Tuesday we took a early morning trip to Diana’s bathes. Which is a series of waterfalls you can walk through. We got there before all the family showed up. They pretty much turn a natural landscape into a water park and it’s kind of depressing. After the waterfalls we startes our way home…. It was sooooooo hot. I mean sooooooo hot I got sunburned through my t-shirt. Kate couldn’t even talk to me. The windows were all open, but the air was so hot there was no relief. I can’t believe Kate didn’t knife me at the end of the trip. 7 hours in the beating sun is enough to convince any jury it was self defense. She didn’t. God love her!